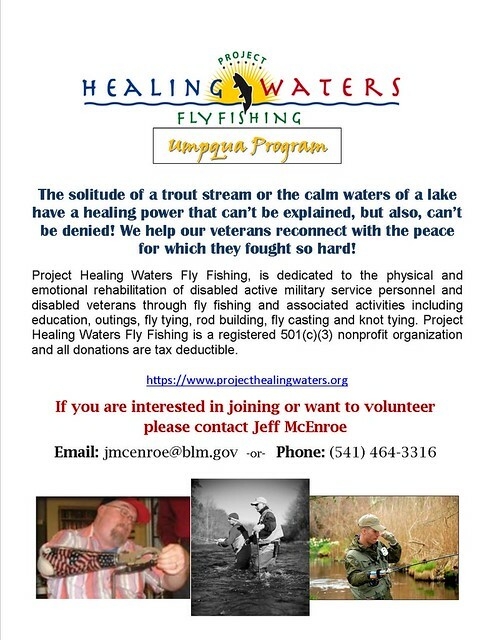 Project Healing Waters – Umpqua & Eugene Programs Need your help! We at The Caddis Fly and OregonFlyFishingBlog.com strongly support and have worked with Project healing waters in the past. We urge you to help the two local groups below in any way you can. Project Healing Waters is a national organization dedicated to the “physical and emotional rehabilitation of disabled active military service personnel and disabled veterans through fly fishing and associated activities including education and outings.” Oregon recently started two new Programs, one in Eugene (Eugene Program) and one in Roseburg (Umpqua Program). These two programs are just getting started and trying to build up enough fly fishing gear and fly tying materials in order to provide classes to Veterans free of charge. So we need your help, if you have some old fly tying materials, fly rods or reels, waders and boots (that don’t leak too bad), etc. bring them by the Caddisfly or give the Program Leads a call (contact information below). We also need volunteers! If you are interested in volunteering, please get a hold of us. This is a great program that is a real help to the people that have bravely served our country and are suffering from physical or emotional disabilities. One Response to Project Healing Waters – Umpqua & Eugene Programs Need your help! I helped cook for an event at Cabela’s, and met the Eugene guys. Great people, better cause. Please help.